Vice-Principal (Advancement) Karen Bertrand listens as Angela Choi explains how the Schulich Leader Scholarship provided her the opportunity to study at Queen’s. Schulich Leaders, from left, Sandra Chan, Sandra Smeltzer, and Isabel Hazan, speak with Karen Bertrand, Vice-Principal (Advancement) about their experiences at Queen's and through the scholarships. Allison Slopack, Director of Advancement, Athletics & Recreation, takes a photo with the Schulich Leader Scholars and Karen Bertrand, Vice-Principal (Advancement). Schulich Leader Scholars at Queen's gather for a photo with Karen Bertrand, Vice-Principal (Advancement) following their meeting in Richardson hall. When Canadian business leader and philanthropist Seymour Schulich established the Schulich Leader Scholarships, his goal was to provide support for leading entrepreneurially-minded students entering a STEM (science, technology, engineering, mathematics) program at one of 20 partner universities. Created in 2011, the scholarships have opened the doors for many outstanding students at Queen’s and the university has attracted the maximum of four leaders each of the past four years. 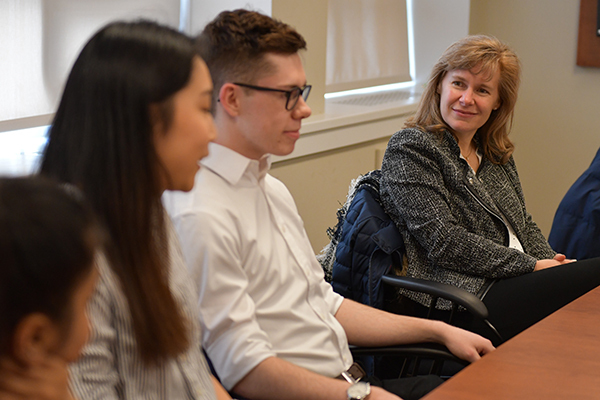 Recently, Queen’s Schulich Leaders had the opportunity to speak with Karen Bertrand, Vice-Principal (Advancement), at a breakfast meeting at Richardson Hall. During the meeting the students spoke about how their scholarships have provided the opportunity to pursue their studies at Queen’s as well as their experiences as recipients of the prestigious awards. For Sonal Gupta, a 2018 Schulich Leader from Kingston, the scholarship solidified her choice of coming to Queen’s despite also wanting to explore the post-secondary world outside of her hometown. The scholarship also helped set a direction as she entered her first year of studies. “Receiving a scholarship like this definitely instilled that feeling that Queen’s is a great school and a great community. I also believe that holding the title of Schulich Leader is not simply just a title. It’s something to attain to, it’s a responsibility to be leaders within our school and be that innovative agent of change that they are looking for,” she says. At the meeting, the Schulich Leaders had the opportunity to find out more about Vice-Principal Bertrand’s work at the university and the important connection between Queen’s and its alumni. She was impressed by the students and their willingness to ask questions of a school administrator. Created in 2011 by Seymour Schulich, the annual nationally-competitive scholarship program encourages high school students to embrace STEM in their future careers. The awards provide financial support to winners over four years of study. This year, there were more than 1,300 Schulich Leader nominees from across Canada vying for 50 scholarships, valued at up to $100,000 each for Engineering and $80,000 for STEM-related disciplines. For more information on the scholarships and full profiles of the Queen’s recipients visit the Schulich Leaders website.